projects designed to energize a nation and promote global trade. Petrochemical refining and allied manufacturing are the leading industry in Southwest Louisiana. hat Southwest Louisiana is vitally important to <?xml:namespace prefix = st1 />America's energy needs is without question. The region's No. 1 export — petroleum in all of its manufactured forms — ends up supplying the fuel source for everything from cars to furnaces all over the country. If local officials and business leaders have their way, the five-parish region tucked along the Gulf Coast and the Texas border will become even more essential to the nation's infrastructure of fuel and power. While various conventional energy firms are in the process of expanding their operations in the Lake Charles area, so too are a host of alternative and other non-fossil-fuel companies. From Shaw Modular Solutions' new plant for manufacturing nuclear power plant components at the Port of Lake Charles to Verenium's cellulosic ethanol factory in Jennings, Southwest Louisiana is humming with the buzz of billions of dollars being pumped into renewable energy projects throughout the region. "The energy industry forms the foundation of our region's economy," says George Swift, president and CEO of the Southwest Louisiana Economic Development Alliance. "Our new mantra is that we will have energy enough for the nation." Judging from the recent influx of large capital investments into the local economy, Swift and his cohorts would appear to be ahead of schedule. When the dust settles on the scores of construction projects in Allen, Beauregard, Calcasieu, Cameron and Jefferson Davis parishes, the region will house new or expanded plants that contribute to the following sectors: nuclear energy, ethanol and cellulosic ethanol, liquefied natural gas and petroleum coke gasification. In addition, several conventional petroleum refineries are expanding. "We supply a lot of the nation's energy needs from right here in Southwest Louisiana," says Swift. "With three LNG terminals, we are probably the per-capita capital of the nation in LNG. And the big project in our region has been Shaw." First announced two years ago as part of a joint venture with Westinghouse, Shaw Modular Solutions is a $100-million investment that retains the corporate headquarters in Baton Rouge while building a new manufacturing plant employing up to 1,400 workers in Lake Charles. 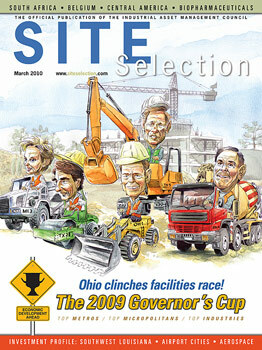 The combined projects were picked as one of Site Selection's Top Deals of the Year for 2008. The state-of-the-art, 410,000-sq.-ft. (38,089-sq.-m.) facility will assemble structural, piping, equipment and other modules for new nuclear power plants using the Westinghouse AP1000 technology — considered the safest and most economical commercial nuclear power technology in the world. The plant sits on 300 acres (122 hectares) at the port. An economic impact analysis performed by Louisiana State University estimates that the Shaw project will result in $17.8 billion in new sales, $4.5 billion in new earnings and 9,205 direct and indirect Louisiana jobs over 15 years. A $7-billion company, Shaw Group employs 27,000 people worldwide. On Jan. 8, the promise of the new Shaw plant was enough to attract a new investor — the federal government. The U.S. Department of Energy and Internal Revenue Service awarded Shaw a $10.8-million federal tax credit, part of the stimulus money coming from the American Recovery and Reinvestment Act of 2009. President Obama delivered the news himself, prompting a welcoming response from Shaw's chief executive. "As President Obama stated during his announcement, these projects must help close the clean-energy gap that has grown between the U.S. and other countries, they must reduce our emissions and they must increase our energy security," said J.M. Bernhard Jr., chairman, president and CEO of Shaw. "Shaw is at the forefront of this commitment through our leadership in the revival of the commercial nuclear energy industry." The plant began limited production in late 2009 and is on pace to reach full production early this year, according to Jack Martin, senior vice president of Shaw Modular Solutions. "We currently have approximately 100 workers, with the possibility for up to 700 to 1,400 workers within a couple of years," he tells Site Selection. "The Lake Charles work force offered the right skill set we needed, from welders to painters to crane operators to the administrative staff necessary to run the facility efficiently and effectively," Martin says. "The industry that already exists in Lake Charles gave us the confidence we'd have a large talent pool to choose from when we established Shaw Modular Solutions." Martin cites the deepwater port and access to multiple modes of transportation as being "critical" factors in Shaw's site selection. He also credits the support Shaw received from state and local agencies. "Gov. Bobby Jindal, Louisiana Economic Development Secretary Stephen Moret, Lake Charles officials — including Mayor Randy Roach, the City Council and the Calcasieu Parish Police Jury — as well as representatives from the Port of Lake Charles, worked diligently to bring this project to the area," notes Martin. Martin adds that Shaw is important not just for the region, but for the entire country. "A project like this is allowing the revival of the commercial nuclear industry in the U.S. to move forward," he says. "In fact, Shaw currently has contracts for six of the first new reactors that will be built in the U.S. in more than 30 years for clients Georgia Power, South Carolina Electric & Gas, and Progress Energy. We've received a full notice to proceed with engineering, procurement and construction services for Georgia Power and are looking forward to utilizing this facility to provide these services for our clients." Secretary Moret says Shaw paves the way for Louisiana to pursue other nuclear energy projects for the region. "We can do that because we have the work force — the most productive fabrication workers in the world because of the petrochemical industry and offshore oil-and-gas operations here," he says. "The nuclear module industry uses a higher-level skill set. FastStart, our custom work-force training program, is being used by Shaw and can be used by other companies in this field. The region also offers terrific transportation and logistics for shipping these modules to other countries." The expansions of Shaw and other energy firms in Southwest Louisiana have contributed to a remarkable economic turnaround in a region hit hard by devastating hurricanes in recent years. Rita, Ike and Gustav all took their toll, but rebuilding efforts have elevated the area's economy to a level far surpassing the nation's. At year-end 2009, Southwest Louisiana recorded an unemployment rate of 7.2 percent, well below the nation's mark of 10.0 percent. The Lake Charles MSA, which comprises the bulk of the five-parish region of 285,618 people, saw its total employment number drop only 0.5 percent from October 2008 to October 2009. During that same period, U.S. employment fell by 4.0 percent. ″ The U.S. Air Force awarded a $3.8-billion contract for KC-10 Contractor Logistics Service to Northrop Grumman — an award that is expected to create at least 300 new jobs at the company's operation at Chennault International Airport in Lake Charles. ″ Cameron LNG, a subsidiary of Sempra Energy, opened as a new liquefied natural gas terminal in Hackberry. The plant has 1.5 billion cubic feet per day of initial capacity, with room for expansion. The $900-million project creates 60 jobs at an average annual wage of $63,000 plus benefits. ″ Cheniere Energy Inc. announced a $220-million expansion of its LNG operations in Cameron Parish. Cheniere already operates the Sabine Pass LNG Terminal on the Sabine River on the Texas-Louisiana border. The company will construct the new Creole Trail LNG Terminal on the Calcasieu River in central Cameron. Upon completion of the new terminal and an expansion of Sabine Pass, the firm will have the capacity of 7 billion cubic feet per day. ″ Trunkline LNG recently completed expansion work on an additional LNG storage tank at the Port of Lake Charles, bringing its storage capacity to 9 billion cubic feet. ″ Zagis USA LLC announced plans to build two cotton-spinning mills in Louisiana, the first of which is being constructed in Jefferson Davis Parish. Combined, the two plants will generate 160 jobs and $75 million in capital investment. ″ British Petroleum announced Feb. 1 that it would award Verenium $2.5 million to fund the company's cellulosic ethanol operation in Jennings. The $75-million plant produces second-generation ethanol from feedstocks such as agricultural waste, wood products and dedicated energy crops. The move extends the two firms' original 18-month partnership. ″ PL Olefins LLC, which operates the Sulphur Mines Salt Dome in Calcasieu Parish, will expand its plant with a $105-million investment in the city of Sulphur. The energy industry's dominance in Southwest Louisiana is reflected in the jobs numbers. Five of the 25 largest employers in the region are energy or chemical-producing companies, including CITGO Petroleum Corp. and ConocoPhillips. The CITGO refinery in Lake Charles is the fourth largest in the nation, with a processing capacity of up to 440,000 barrels of crude oil per day. The 2,000-acre (810-hectare) complex employs 1,200 people. The ConocoPhillips refinery in Westlake has a crude oil processing capacity of 239,000 barrels per day and employs 765 people. More than 53,000 workers in Southwest Louisiana are employed either directly or indirectly by petrochemical and refining operations. Total annual payroll and benefits paid by energy employers in the region exceed $713 million, and industry firms collectively spend about $1.2 billion on utilities each year. Petroleum, in all sorts of fuels and other refined and manufactured products, accounts for 85 percent of the region's exports, according to Mike Dees, general counsel and head of real estate for the Port of Lake Charles. "The petroleum industry has felt the recessionary effects as the generation of plastics and some other things has gone down somewhat," says Dees. "But the refining of oil for gasoline, jet fuels and diesel fuels has not been impacted that much." As a result, activity still bustles at the 11th largest seaport in America. The port encompasses 203 square miles (526 sq. km.) in Calcasieu Parish and annually handles 5 million tons of cargo at two marine terminals. Property tax abatements and Gulf Opportunity Zone Bonds make the port an attractive location for capital-intensive projects like Shaw and Lake Charles Cogeneration. "This area still qualifies for more than $1 billion in GO Zone allocations in tax-exempt financing," Dees says. "These bonds have very low interest. That is a real incentive for industries to locate in our area." Pinnacle Entertainment likes its port location so much that it has decided to expand its flagship casino hotel. Larry Lepinski, senior vice president and general manager of the L'Auberge du Lac Casino Resort in Lake Charles, says the property is on track to open its $305-million, 400-room expansion by the spring of 2011. "The project includes an extension of our existing hotel building, a 3,000-seat multipurpose venue for entertainment, and many other amenities," Lepinski says. "We are anticipating that another 1,000 jobs will be created on site, and that doesn't count the construction jobs." L'Auberge is already the largest private employer in the five-parish region, providing paychecks to 2,400 workers at the resort. Lepinski says his company is expanding because "we have faith that the economy in our region is bouncing back, and we want to be ready with this project when we start seeing a more normalized economy." Pinnacle's largest resort at more than 1 million sq. ft. (92,900 sq. m.), L'Auberge attracted an average of 400,000 visitors a month over the last six months, says Lepinski. "On some occasions, we were seeing over 25,000 people a day." Despite the economic slowdown, Lepinski says, "our head counts in 2009 were very close to what we had in 2008. The economy has been challenging, but we have not lost the qualities that make L'Auberge a hit with our customers. We have not compromised our values at all." Energy and entertainment companies are not alone in finding growth opportunities in Southwest Louisiana. Area aerospace firms are ramping up with new contracts precipitating expansion projects. Northrop Grumman and Aeroframe Services LLC recently announced major expansions at Chennault. While Northrop Grumman is gearing up to service the KC-10 wide-body aircraft, Aeroframe plans to add 300 jobs. "We are expanding our facilities at Chennault to include three new hangars to support KC-10 CLS," Joseph Stein, deputy director of Contractor Logistics Service Programs & Sites Support for Northrop Grumman Technical Services, tells Site Selection. "We are adding about 475,000 sq. ft. [44,128 sq. m.] of hangar, administrative and storage space. Upon completion, we will have 870,000 sq. ft. [80,823 sq. m.] on site." The $10-million capital investment will grow Northrop Grumman's Chennault-based work force from 264 today to 464 by the end of the year, notes Stein. "The work force here is highly skilled for the aerospace industry," he adds. "We just hired 115 people who are coming on board to support the new airplane work. During a job fair in December, we had 800 people show up from around the area. Over 25 percent of those applicants were prime candidates that we could have hired on the spot." Stein says that the support of state and local economic developers "enabled us to bring the KC-10 to Lake Charles. They have worked with us throughout the program. We had roughly 90 days to move our operation from San Antonio to Lake Charles. The state's grants enabled us to get the hangar modifications we needed and to purchase the support equipment. Also, I met yesterday with the Louisiana Economic Development training personnel at FastStart. They are helping us put together a program to link training with the community colleges. That training helps develop the talented aerospace industry work force in the area." Northrop Grumman chooses to do business in Southwest Louisiana largely because of that government support, Stein says. "The state of Louisiana gets it. They understand our business," he adds. "They have a vision and they know where we want to go. They are very savvy in looking at programs and seeing what they have to offer to meet our needs. And they know the importance of the aerospace industry to the national defense. Our job is to supply direct support for the war fighters and make sure that we give them the best airplanes we can provide. The state is willing to invest to make sure we reach that goal." On Feb. 5, Aeroframe added to the job influx by announcing its own expansion at Chennault. The largest Airbus maintenance, repair and overhaul company in the U.S., Aeroframe will hire 300 workers at a new 120,000-sq.-ft. (11,148-sq.-m.) warehouse. The expansion brings the company's total Chennault work force to 550 and its annual payroll to more than $30 million. FedEx is the firm's primary customer. "We fully expect this ramp-up to be widespread and sustained for many years. But the competition to service these aircraft will be fierce and on a global scale," said Aeroframe President and CEO Roger Porter. "The good news is that the state of Louisiana and local political bodies, through Chennault Airport Authority, have continually invested in the airpark for many years to ensure it remains a premier facility and that the productivity of our work force remains the best in the industry. This allows us to compete in the global marketplace — and win." Louisiana Gov. Bobby Jindal added, "I'm thrilled to announce this exciting expansion of one of Southwest Louisiana's largest private-sector employers. This expansion is yet another big boost for the Lake Charles area economy. Thanks to our national-caliber work-force initiative, Louisiana FastStart, Aeroframe will be able to recruit and train 300 new workers in as little as six months." With job-hiring projects like these and others cropping up throughout Southwest Louisiana, Secretary Moret is bullish on the region's growth prospects. "This part of our state has had a very constructive and proactive recovery effort. New building standards enacted here will help protect the region from future storms," Moret says. "The region has so much going for it." And the biggest prize of all may be yet to come, he adds: design and construction of a new deepwater port. While the plans are preliminary, momentum is definitely building to give Southwest Louisiana a deepwater alternative to Port Fourchon south of New Orleans in the eastern part of the state. "This has the potential to become Fourchon West for the state of Louisiana," Moret says. "There is a growing sense that there could be the potential for a facility not unlike Port Fourchon in Southwest Louisiana to service the new oil-and-gas finds that are directly south of that region in the Gulf of Mexico. We are starting to put some attention in that area, and there is definitely some local enthusiasm for it." One of the idea's biggest backers is Lynn Hohensee, director of the West Calcasieu Port and coordinator of the Southwest Louisiana Port Network, a group comprising the leaders of all six ports in the region (WCP, West and East Cameron Ports, Port of Lake Charles, Port of Vinton and the Mermentau Port). "There are only two places in the state where you can drive to the Gulf in your car. One is at Port Fourchon. The other is here at the mouth of the Calcasieu River in Cameron Parish," says Hohensee. "As exploration projects in the Gulf spread out east and west, it is getting harder to reach these locations in a one-day boat ride. The oil-and-gas industry needs another shore base further to the west to provide deepwater access. We would like to capture that shore base at the mouth of the Calcasieu River. This has critical potential for the whole region." Ernie Broussard, director of planning and development for Cameron Parish, agrees. "This has the potential to create 5,000 direct jobs and $200 million in investment and another 13,000 indirect jobs," he says of the potential new port. "We would see seven times that amount in total economic impact, according to our base plan. We see a five-to-seven-year window for this project." With or without the new port, Moret says "the outlook is very good for a well-diversified economy in Southwest Louisiana. We have been pleased to see the success of George Swift's group, the Southwest Louisiana Economic Development Alliance, and their capital campaign. That is a good indication of where the community is going. This is truly one of the most exciting growth regions in the state." This editorial profile was published under the auspices of the Southwest Louisiana Economic Development Alliance. For more information, contact George Swift, president and CEO of the Alliance, at 337-433-3632. More details can be found on the Web at www.allianceswla.org. Other major industries in the region include aerospace maintenance and repair, marine vessel maintenance and fueling, and eco-tourism. A new $45-million terminal enables Lake Charles Regional Airport to accommodate American Airlines, which began service to Dallas-Fort Worth International Airport last year. Heath Allen (right) is the airport’s executive director. oastal commerce isn't confined to seaports in <?xml:namespace prefix = st1 />Southwest Louisiana. At Chennault International Airport and Lake Charles Regional Airport, trade takes the form of flight maintenance and on-the-ground logistics. "We serve as the home base of Northrop Grumman, Aeroframe, Million Air FBO, Louisiana Millwork and other operations," says Randy Robb, executive director of the Chennault International Airport Authority in Lake Charles. "With a 10,700-foot-long runway, there is no airplane we can't land here." With 2 million sq. ft. (185,800 sq. m.) of hangar and warehouse space and 800 acres (324 hectares) of developable land, Chennault has become a magnet for companies seeking growth opportunities in the region. Foreign Trade Zone benefits and state tax incentives are available on site too. "It looks like the airline companies — Frontier and others — are having to catch up with overall fleet maintenance. FedEx is doing better now, and all that adds up to more business for Aeroframe," Robb says. "We completed the ATC Control Tower and our Million Air FBO has a 15,000-square-foot [1,394-sq.-m.] corporate hangar now. We are working with the state to get funding for an offshore helicopter support facility." While most of the flights at Chennault come from aircraft being serviced by Northrop Grumman and Aeroframe, "we do about 2,500 charter operations of passengers per year. We increased that total this year because of the increased traffic at the Fort Polk Army Base. Total takeoffs and landings this year of all aircraft will be above 60,000. Air cargo will be less than 50,000 tons." Robb says the No. 1 goal of his airport is to support economic development in the region. "We want sustainable job growth, both at the airport and elsewhere," he says. "We make over a $40-million direct economic impact on the community each year and over a $114-million indirect impact." At nearby Lake Charles Regional Airport, expanding flight operations are prompting construction. "We opened our new passenger terminal this past year," says Heath Allen, executive director of the airport known as LCH. "It is all state of the art. It gives us more efficiency, and it makes a good first impression." The $28-million, 45,000-sq.-ft. (4,181-sq.-m.) terminal enables LCH to accommodate American Airlines, which began regional service to Dallas last June. "We had not had that in 10 years, and now we have two flights a day to Dallas," Allen notes. "DFW is our No. 1 outbound market." LCH already provided service to Houston through Continental. "By adding connections to Dallas, it allows us to have more connectivity to the worldwide aviation system," adds Allen. "Our traffic is up 16 percent since American came in." The airport is undergoing $119 million in capital improvements including work on the access road, lighting, the airport fire station and signage. "We have 1,800 acres [729 hectares] that are available for development," says Allen. "With the Shaw Modular Solutions facility nearing completion just a stone's throw from here, we are hoping to see some spinoffs from that project." Snapshot: Dr. Jim Sandefur, chairman of the Industrial Development Board that oversees the <?xml:namespace prefix = st1 />Allen Industrial Park, says that Allen Parish may be small and rural, but its cost of living is low and its work force is good. "They used to harvest trees with chainsaws. A lot of those people are no longer employed in the woods. They are now available for other blue-collar jobs," he says. Sandefur's goal is to create more jobs at his industrial park. "The park site used to be owned by Arizona Chemical Co., which was owned by International Paper Co.," he says. "We purchased the site from them. We have 200 total acres [81 hectares], including 67 acres [27 hectares] available for development. We have a spur that connects to Union Pacific Railroad. We are 45 miles [72 km.] from Interstate 10 and about 30 miles [48 km.] from I-49. Rent on all or part of the site is very low. The site would be ideal for a manufacturing plant." Snapshot: J. Mac Holladay, founder and CEO of Atlanta-based Market Street Services, recently conducted a comprehensive analysis of the Beauregard Regional Airport in DeRidder. "This was an old Army Air Base used in World War II. It was declared surplus in 1946 and was deeded to the parish police jury," Holladay says. "It is quite large, about 4,300 acres [1,742 hectares]. It has good rail and highway access and a long runway, as well as good hangar space. There are over 1,000 acres [405 hectares] of developable land on site, and there are no easement or right-of-way issues. We are trying to see if the site could qualify for the Louisiana Mega-Site Program." With nearby Fort Polk undergoing a 100,000-acre (40,500-hectare) expansion, Holladay says the airport is primed to capitalize on the influx of troops and operations to the area. "If the airport can be turned into a truly multimodal site, then it could really succeed." Snapshot: Lynn Hohensee, director of the West Calcasieu Port, says the 190-acre (77-hectare) port in Sulphur received a boost in November 2009 when F. Miller Construction, a subsidiary of the Orion Marine Group of Houston, became the port's latest tenant. "They build bridges and bulk heading and do all kinds of maritime work," he says. "They are on board at our port and we are very excited to have them." Hohensee says the WCP will "seek funding from the Louisiana DOT for expansion of our barge basin to open up more business opportunities. We are talking to several smaller businesses right now. We are not a commodity port. There are no tariffs on cargo here. We are a shallow-water port, so we are truly a services-based port. We provide barge fleeting operation support. We have maritime diesel repair support and construction support companies here, and we are in talks with other companies that the maritime industries need — such as bulk fueling and barge cleaning." The port's strategic location halfway between Houston and New Orleans is a prime drawing card, notes Hohensee. Snapshot: Ernie Broussard, executive director of planning and development for Cameron Parish, says, "We are the parent agency for a $200-million recovery and redevelopment initiative. We are out of recovery and into redevelopment now." The multi-tier plan includes reactivation of all infrastructure that had been damaged by hurricanes in 2005 and 2008; a $24-million housing program designed to facilitate the repopulation of the parish; the development of Cameron Square — a mixed-used waterfront project that houses the courthouse and a new correctional facility; and support for fisheries, marine and maritime industries, and eco-tourism. "Our goal is to create a destination community for the growing sector of recreation seekers," he says. "Shelling, birding, hunting, fishing — we have all of that here, and we think we can capture the attention of naturalists from all over the country. We are administering a very deliberate strategic plan that ultimately will lead to a model coastal community." Snapshot: Marion Fox, executive director for economic development and tourism in Jefferson Davis Parish, says the parish got a shot in the arm from recent expansions from Zagis USA, Verenium, LEEVAC and Talen's Marine & Fuel. "Talen's is building a new facility in Jennings after moving from Lake Arthur," she says. "They service all of the tugboats throughout Southwest Louisiana. They sell diesel fuel. That is their main business." The company is investing about $7 million and adding 20 jobs. "Our outlook for 2010 is extremely good," she adds. "We are continuing to work with prospects at the Lacassine Industrial Park." The 200-acre (81-hectare) park is a half mile from I-10. "The alternative fuel industry seems to be at home in this parish, with Verenium and Louisiana Green Fuels. We have open land and the transportation facilities to handle commerce, and we are only 20 minutes from the Port of Lake Charles. Once business executives come here and realize how close we are to major cities, it makes a big difference."